I am new to the BI realm so forgive me for any mistakes in my understanding. I am designing a Cube using Pentaho with Saiku and have created a basic star schema to support it. My fact table consists of a few facts which are numerical values representing hours of work and cost of work and surrogate keys to the dimension tables. I need to be able to perform sorting, filtering and querying on several dates related to my fact records. I have created a date dimension to accomplish this. The problem I am having is relating my fact table to this dimension multiple times. Using Schema Workbench I managed to create multiple DimensionUsage records for each of my surrogate keys with different names each pointing to my date dimension. Upon importing this Mondrian file back into Pentaho and creating a new Saiku Query I am presented with my list of measures and the related dimensions. 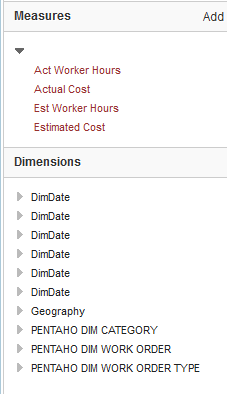 The issue is that all my references to my date dimension are named the same, the name of the dimension table rather than the name I specified in Schema Workbench. I am unable to tell which relation is for which date field. Any ideas of where I may have gone wrong or is this a limitation of the products I am using? Browse other questions tagged pentaho business-intelligence mondrian dimensional-modeling saiku or ask your own question. Is there any way to add range in 'Date' dimension for saiku-analytics 2.3 plugin for pentaho-bi-server 4.5?